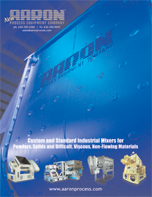 The Mixer Extruder, Standard Hydraulic Tilt, Lo-Boy® and Bottom Dump models can be furnished with hydraulic motors mounted directly to each mixer shaft. This extraordinary flexible design enables you to alter each blade speed independently and adapt to batch viscosity at different stages of your process cycle. This allows for progressive speed increase during start-up under full load, as well as blade reversal for aiding discharge.